How Much Vitamin D Should I Take for Depression? How Is Vitamin D Related to Depression? Depression is a problem that affects many people around the world. Its causes include factors like unemployment, divorce or loss of loved ones. Researchers have come up with various treatments, depending on the level and type of depression. Medication and other therapies may be prescribed. Vitamin D is also recommended with the amount to be taken depending on a number of factors. If you have depression, and are wondering how much vitamin D to take. Keep reading to find out. Whether vitamin D helps cure depression or not is still unclear. What is clear, however, is that it certainly alleviates the symptoms. Studies have displayed that depressed patients have remarkably low levels of vitamin D. It is, however, unclear whether vitamin D deficiency is a result of depression or vice versa. It has also been observed that patients that were put under a high dosage of vitamin D displayed fewer symptoms. Owing to its increasingly dangerous nature (there are approximately 36,000 suicides per year in the US only), it only seems reasonable that such patients are put under a high dosage of vitamin D.
It is recommended that those suffering from depression supplement their diets with high doses of vitamin D. To attain a healthy level, one should take from 5,000 IU (125 mcg) to 10,000 IU (250 mcg) per day. For those with more severe forms of depression, a higher dose such as 20,000 IU (500 mcg) per day is recommended. The latter, however, will have to get their levels checked at least two times a year. One may also opt to take foods rich in vitamin D instead of the supplements. But the question will remain how much vitamin D should I take for depression? It is important to note that most vitamin D foods do not contain vitamin D3 which is most easily absorbed by the body. Instead, foods like orange juice and mushroom contain vitamin D2, which is harder to absorb. The best sources of vitamin D3 include cod liver oil, salmon fish oil, mackerel, tuna, and sardines. It is therefore more prudent to buy the vitamin D supplements instead. These are direct sources of the vital vitamin D3. They should be purchased from reputable and trustworthy companies. A receptor is an organ or cell that receives stimuli such as pain, heat, light or pressure, and transmits the stimuli to the spinal cord which in turn transmits it to the brain. Vitamin D receptors are found in the brain, more specifically in areas that induce depression. It is for this reason that vitamin D has been linked to depression and other mental health problems. The exact functioning of vitamin D in the brain is not quite understood. Neuroscientists have come up with a theory suggesting that the amount of vitamin D present in the is relative to the amount of some chemicals called monoamines in the brain. It is thought that vitamin D also affects the way these chemicals work. In addition, the enzyme that controls the rate of production of serotonin, a monoamine; is controlled partially by vitamin D. It is important to note that most anti-depression medication works by increasing the amount of monoamines present in the brain. Scientists have therefore come to the conclusion that vitamin D helps increase the amount of monoamines which helps treat depression. Therefore, anyone that decides to undertake this as a way of treatment should seek the answer to the question, how much vitamin D should I take for depression. As explained above, this will vary depending on the level and form of depression. Omega-3 fatty acids are present in cold water fish oil, unlike the more common omega-6 acids which are readily available in canola oil and nuts. Most people, especially in America, have low levels of omega-3 acids. 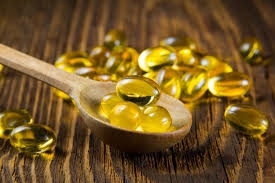 Some scientists suggest that insufficient amounts of omega-3 acids cause problems in transmission of nerve impulses, which may eventually lead to depression and anxiety. In support of this, a study conducted in 2007 found that adult humans with high omega-6 diets and low omega-3 intake had significant amounts of pro-inflammatory cytokines-molecules which result from depression and anxiety. Another study conducted in 2009 showed that people suffering from depression had very low levels of vitamin B6. According to some doctors, vitamin B-6 and B-3 help conserve an amino acid called tryptophan, and convert as much of it as possible into serotonin. Serotonin is a monoamine whose presence in the brain reduces depression. Serotonin also acts as a brain neurotransmitter which basically means that it helps transmit signals between brain cells. Scientists further recommend an addition of vitamin B-12 and folic acid if treatment with vitamin B-6 and B-3 is not effective. This is due to the fact that some people suffering from depression have been found with low levels of vitamin B-12. In addition to asking how much vitamin D should I take for depression, omega-3 and B-complex, other supplements like 5-HTP have been found to be beneficial in the management of depression. 5-HTP is an abbreviation for the amino-acid hydroxytryptophan. This is recommended when SSRIs do not work. While these slow down the uptake of serotonin, 5-HTP is converted to serotonin and automatically relieves depression. True to this, a study conducted on 63 people showed that depression patients that took prescribed 5-HTP had reduced stress levels similar to those who took other anti-depressants, only with fewer side effects. Theanine is an amino acid that is usually found in green tea. It triggers the release of gamma-aminobutyric acids which further trigger neurotransmitters that induce a calming sensation. This relaxes the mind and significantly reduces depression. Theanine is recommended as being more effective than other supplements containing synthesized GABA, which is harder to absorb. Server responsed at: 04/22/2019 2:02 p.m.